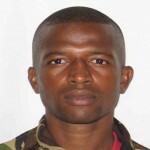 Ex-Defence Force star Josimar Belgrave is one of two former soldiers who were charged with a combined 162 fraud and corruption matters in the Port-of-Spain Magistrates’ Court yesterday. Belgrave, a private, and Jason Richards, a lance corporal, were accused of stealing TT$1.4 million from the State by fraudulent means between February and July 2017. Both men are 31 years old and, as per Defence Force rules, were fired from the Regiment once charges were formally laid. 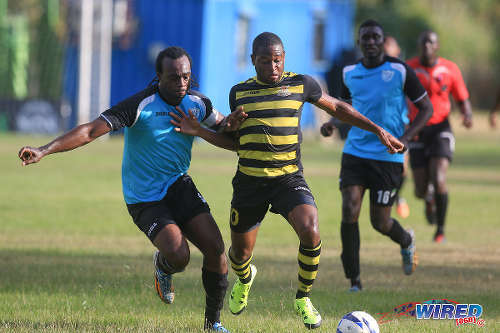 Photo: Defence Force attacker Josimar Belgrave (right) holds off WASA defender and captain Akil Harley during 2015/16 National Super League Premiership Division action in St Joseph. 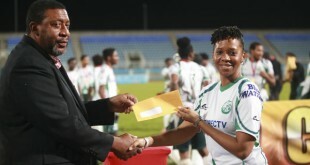 Belgrave, a versatile attacker who can play upfront or in an attacking midfield role, is a two-time Pro League champion with Defence Force while he also led the the Army/Coast Guard combination to the Trinidad and Tobago Super League (TTSL) crown two years ago and finished as top scorer in the process. 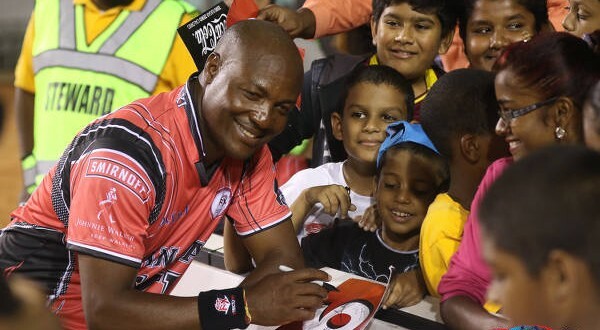 Belgrave himself never played for Trinidad and Tobago at senior international level but his younger brother, Elijah Belgrave, who represents Police FC in the Pro League, won two national caps under former coach Stephen Hart. His sister, Rhea Belgrave, was a key member of the Trinidad and Tobago Women’s National Senior Team during their Canada 2015 Women’s World Cup campaign and is also a former NSCAA All-American with West Texas A&M University. Senior Magistrate Nanette Forde-John heard yesterday that Richards, an accounts clerk with the Regiment, allegedly stole over $1 million by inflating his and Belgrave’s rental allowances through the falsification of the human resources record. Belgrave was accused of wilfully transferring and disposing of the funds, knowing them to be the proceeds of criminal misconduct. 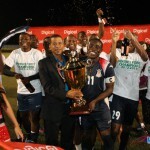 Photo: Defence Force players (from left) Josimar Belgrave, Rodell Elcock and Curtis Gonzales celebrate during their 4-0 conquest of Caledonia AIA in the 2014-15 Pro League season. The offences were alleged to have taken place in the Port-of-Spain, Arima, Tunapuna and Chaguanas areas. Police prosecutor Inspector Winston Dillon objected to bail on the grounds that the accused may interfere with or intimidate witnesses. 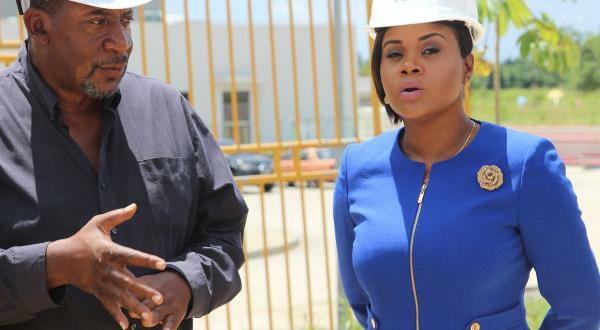 However, the magistrate granted bail in the sum of TT$375,000 to the two accused for offences allegedly committed in the Port-of-Spain district. Bail was denied for offences allegedly committed in other districts, though, and Belgrave and Richards were remanded into police custody until they complete their tour of the relevant Magistrates’ Courts. Belgrave, who was represented by attorney Stephen Wilson, and Richards, represented by Darryl Worrell, are due to re-appear in the Port-of-Spain Court on 14 November. Belgrave is one of three members of the Defence Force’s title winning 2012-13 team who are in jail at present. 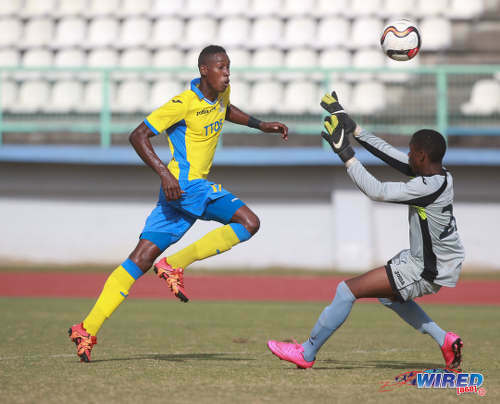 Versatile 23-year-old winger Ross Russell Jr and speedy 35-year-old attacker Balondemu Julius were incarcerated last year for the murder of then 28-year-old Diego Martin resident Selwyn Gaff. Photo: Defence Force winger Ross Russell Jr (left) lifts the ball over Police FC custodian Perry O’Connor for his team’s third goal in 2015/16 Pro League action in Malabar on 26 January 2016. On 6 June 2016, Gaff died of a gunshot wound after being found by police barely alive in the Macqueripe forest. He had allegedly been shot in the abdomen on the previous day and left for dead. Two other 2012-13 team members, Kevon Carter and Rawle Fletcher, passed away in tragic circumstances. The 30-year-old Carter, who represented Trinidad and Tobago at the 2013 CONCACAF Gold Cup, died of a heart attack on 28 February 2014, after collapsing during a training session. Fletcher, 31, was murdered on 22 December 2013 outside the Sandy Annan Bar near his home in Preysal, Couva. His close friend, Mitra Maharaj, and a 19-year-old bystander, Anil Diram, were also killed. 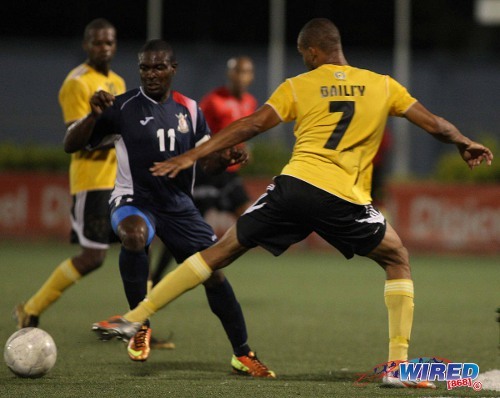 Photo: Defence Force winger Kevon Carter (left, forground) glides past T&TEC player Christian Bailey during a 2012-13 Pro League match. Carter died of a heart attack on 28 February, 2014. Repay the money,but some jail time is warranted . set an example, not a slap on their wrist. ITS call STEALING. 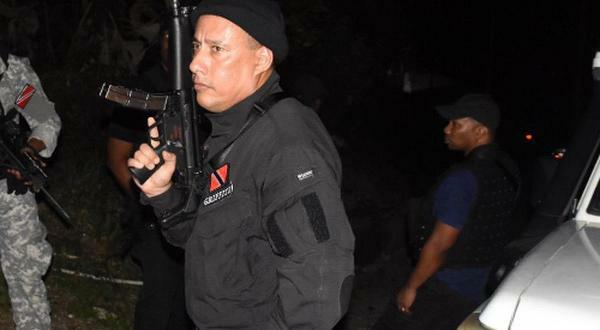 In Africa the army is the tribe with guns..in Trinidad the army /police the gangs in uniform? 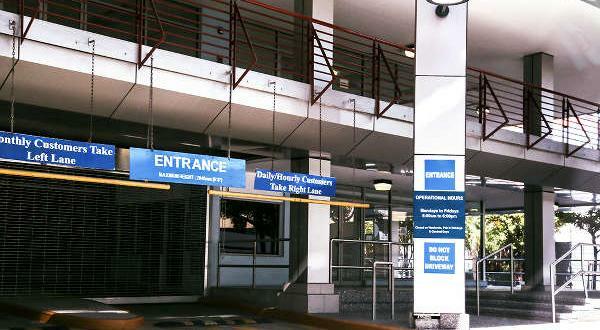 “Two soldiers, accused of defrauding the Defence Force of $1.5m in an alleged payroll scam, have agreed to repay the money. Ah wonder how dey going tuh find de means to pay back all dat money if dey spend it out ahready? The defence force is definitely the wrong set of people to rob, or even attempt to rob, they get through. Like seriously ….. what Rhea or Elijah have to do with this ………..
Know anywhere we could get 2 million to steal. when do we get to charge the government for defrauding us? that team was cursed ? Well ah have to correct you on that one eh not all the officers like mehself are rogue eh and yes we knew all who was corrupted and maybe never say nutten or exposed them but eventually they use to bounce their heads and get caught yes because my Father God does deal with you privately and when you don’t get the message he does deal with you publicly eh how do you think that meh corrupted Jack Warner finally got exposed eh, meh Father God raised up meh friend Mr. Live Wire and the fella Jennings from England in order to do so eh. Them really good yes. I want to believe that some of them have to much women to support yes other than their wives and they never think about getting caught yes and as I always tell them when you commiti a crime you will always have to do the time eh, so let them continue with their madness and don’t understand that they will all be exposed especially with the nowadays video/ other type of technologies that they don’t even know that exist in our sweet country to finally stamp out plenty of the corruption in meh protective services and in our sweet country eh, they need to stop with their wrong choices in life and eat little and life long eh. Them really good yes. Is it because football not paying ( we know them boys catching the nen nen for years while the big boys at the top filing the shirt and pants pocket full) Or is it the army wages too low. I know its not justification, They brave oui. have to stand the consequences? Do they ever think of their wives and kids and families? Eveyrbody want’s fast money. Microwave…. now for now, no one wants to sweat. Well one of the national team goal keepers got kicked out of the army and now is in court for a robbery eh I don’t know if that matter has resolved as yet ah forget his name yes. Them really good yes. So over the last 18 months we’ve had Ross Russell Jr., Balondemu Julius, Josimar Belgrave, Damani Richards, Noel Williams, and Kemuel Rivers. Any more? i forgot Kemuel… but then he got off. Is it that they are now taking crime off the streets and putting it in Tetron, as part of the new initiative to fight lawlessness..Sadly this type of conduct in the ‘protective services’ is almost traditional. Well since long time ago about 30 yrs and more the motto was always to protect and serve and theif whenever you can yes and this goes for all the other protective services to eh especially them fellas who suppose to be protecting our waters eh. and the madness still continuing today Them really good yes. Sounds as if the Defence force could put out a team from Remand Yard, with police officers on the bench. I often wish to find the means to practice as a lawyer. Cause I not going back to school, Though, I did apply to the Makandal Daaga Law Scholarship; kind of. Maven I was being tongue-in-cheek, I think it’s fraud if anything. The state would have to prove the intent though. Champions League keeping me from reading the article, so I don’t know the facts just yet. And the thing about the fraud, theifing the monies business, the monies are never recovered eh at least the most part of it ah wonder what does happen to it eh. Them really good yes. Just read the article and what is detailed is straightforward fraud, in this case obtaining reimbursement for (rental) expenses by fraudulent/deceptive means. What always baffles me is how these guys could do something so brazen/obvious and hope to get away with it. I still cannot believe that my prolific other goal scorer Josimar Belgrave the same as the other player a police officer who was also held with other police officers robbing the chinese man that represented the team “Frontline” from St. Anns that I supported in the WI sports football tournament that they won the $ 50, 000 monies lat year at the Mandela park. I know that his Father “Tractor” Senior Belgrave must be rollling in his grave. Them really good yes. Innocent until proven guilty. Hope they receive a fair trial and just outcome. I never spoke to him. On the field, he was talented and hardworking. Sad that he is now in this position. But let justice be served now. Maven Huggins There is a new movie out “American Made” with Tom Cruise you can even watch it on 123movies and you will see what happened wiith respect to the drugs trade when President Nixon was in power and the fella call Escobar and the president of Nicaragua Noreiga I think it was who the CIA was supporting and was eventually overthrown because he got out of hand eh and you will understand that the real crooks are the ones in the high places that never gets touched. Alyuh really feel that these soldiers pulled this off by themselves eh. Them really goood yes. Fbnot letting me love your comment, Earl. I went in to read about this so-called theft, and was stunned at the article: reading like a roster of tragedy. All these men dead, killed, or in prison??? Who are the bandits. And at the article title I felt no regrets. So they take $1.6million how much the president take and taking? And none of the top charged. Josimar looks like he was so named as the Brazilian full-back beat Pat Jennings in the 1986 World Cup final .